WHY MAINTENANCE AND REPAIRABILITY SHOULD BE BUILT IN TO THE PRODUCTS WE BUY. Products are often designed to be thrown away when they fail. This is especially the case in respect to small electronics devices. However, there is a growing consumer compaign, to ensure that products are as environmentally friendly as possible. One way that this can be achieved, is through designing products that can be repaired and maintained. One such product is the kettle seen below. Everyday domestic products such as kettles, require maintenance / checks to keep them in safe working order. 1. Label / identify three parts of the kettle that could eventually fail, stopping it working properly or making it dangerous to use. 2. Some parts of the kettle need checking and even maintenance, to ensure that its working life is extended. For each of the parts you named in question 1, explain the checks / maintenance each requires. The fuse protects the user. If a fault develops, for example an electrical fault, the fuse should ‘blow’. This stops electricity to the kettle, ensuring it is safe. 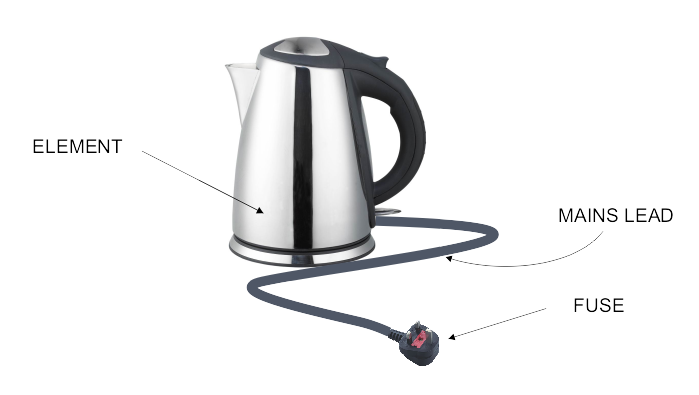 Once the kettle is repaired, the fuse will need replacing with a fuse of the same value (3amp, 5amp or 13 amp). Over time the mains lead can become damaged. The outer insulating plastic layer can develop cracks, revealing the live electrical wires underneath. The user must replace the lead with the same type, ensuring continued safe use. The element is found inside the kettle and heats up the water. Sometimes this part fails. This may be because it is old or the kettle has been used regularly, wearing out the element. A qualified electrician can fit a new element, prolonging the working life of the kettle. 3a. Name another domestic product that should be checked regularly. 3b. Briefly describe the checks you would carry out, on the product you named in 3a. A lawn mower has rotating blades. These should be checked to ensure that they are securely fitted, before the lawn mower is used. The mains lead should be plugged into a residual circuit breaker (RCB). This will ensure that electricity will be cut to the mower, if an electrical fault develops. The mains lead should be checked for breaks in the insulating layer and replaced if necessary.